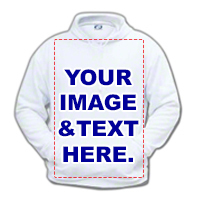 Adult Large Vapor Basic Hoodie Sweatshirt, Brighter White, Tubular Front Pocket. Medium-weight, 10oz, 100% Spun Polyester, looks and feels like cotton, wicks moisture away from skin, dries faster. Odor, bacteria, fungal and mildew resistant. Adult Vapor Basic Hoodie Sweatshirt, Brighter White, Tubular Front Pocket. Medium-weight, 10oz, 100% Spun Polyester, looks and feels like cotton, wicks moisture away from skin, dries faster. Odor, bacteria, fungal and mildew resistant. Print area up to 11 X 15 sublimation printing.